Bethesda is inviting gamers to return to the Wasteland on 26th September. 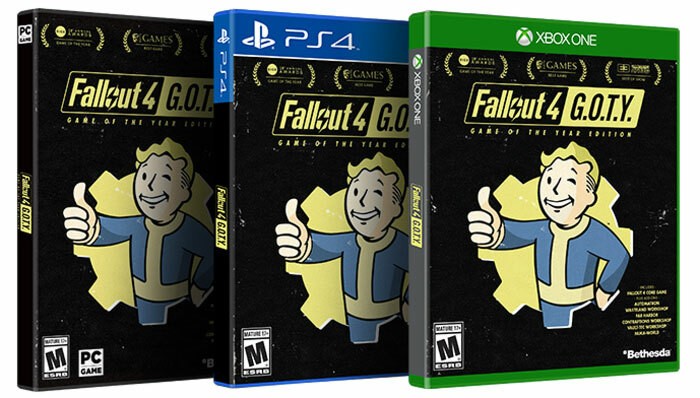 On this date Fallout 4: Game of the Year Edition will be released for PC, PlayStation 4, and Xbox One. The Game of the Year Edition, or GOTY for short, includes the fully updated original game along with all six add-ons: Nuka-World, Vault-Tec Workshop, Contraptions Workshop, Far Harbor, Wasteland Workshop, and Automatron. We are told that Fallout 4 has won over 200 'best of' awards including the 2016 BAFTA and 2016 D.I.C.E. Game of the Year. It was certainly highly anticipated and I remember well the pre-release teasers, leaks and so on being very popular. On release Fallout 4 had its fair share of bugs and issues. The majority of such annoyances should have been quashed by now and then there have been various enhancements delivered since launch to make it more appealing. Beyond the included six pack of DLC in the GOTY, there are also graphical enhancements in the game, gameplay updates (including Survival mode). Mods are available for both PC and consoles and you can make your own customisations using the free Creation Kit on PC. 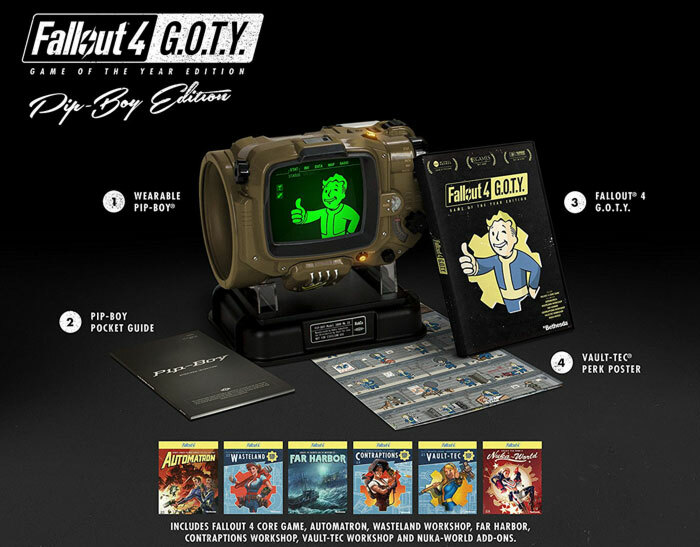 Bethesda says it is celebrating the launch of Fallout 4 GOTY with the release of a limited quantity of Fallout 4 GOTY. Pip-Boy collector editions, exclusively available in North America at select retailers. If you live stateside you can grab this $99.99 edition, which includes a wearable Pip-Boy smart band, a Pip-Boy pocket guide, Fallout 4 GOTY, and a Vault-Tec poster. I checked the Amazon pre-order link slightly above this text, and the GOTY Pip-Boy edition will ship to the UK for an extra $10.46. So any news on whether they have tried to improve performance?? Ryzen performs relatively poorly in FO4,so wondering if Bethesda have improved performance due to their new partnership with AMD. It was the same thing with Skyrim - the community had to step in to improve CPU performance months before Bethesda patched the game. Just asking since I play the game quite a bit,and performance in this game will probably be a factor when I upgrade my PC!! I've got all the DLC on PS4, it's a great game but I jumped in to Far Harbor before completing the main game and I got very bored. Think I might hop out and do some more of the story. Kind of wish I went for it on PC, but the console version is fairly good, and it supports some workshop items. As an exploration game I still find things I haven't before noticed after nearly two years of playing the game - there was even one place which was a tribute to Cheers(!). Try modding the game too - it really adds another dimension to the game as a whole. Are they going to be launching it on GOG at the same time or is this a steam exclusive for now?